Songbird, winner of the 2017 Delaware Handicap. Photo by The Racing Biz. Claiborne Farm and Adele Dilschneider’s Elate tops the 81st renewal of the $750,000 Grade II Delaware Handicap at Delaware Park this Saturday. The mile-and-a-quarter filly and mare summer classic has attracted a field of nine. Elate has been installed as the 2-1 favorite on the morning line. She is slated to carry 117 pounds — three fewer than highweight Unbridled Mo (5-2) — and leave from post six under Jose Ortiz. The 4-year-old daughter of Medaglia d’Oro has not been out since finishing fourth in the mile-and-an-eighth Grade I Breeders’ Cup Distaff at Del Mar on November 3. Previously, the Kentucky-bred trained by William Mott won the mile-and-an-eighth $400,000 Grade I Beldame at Belmont Park on September 30. 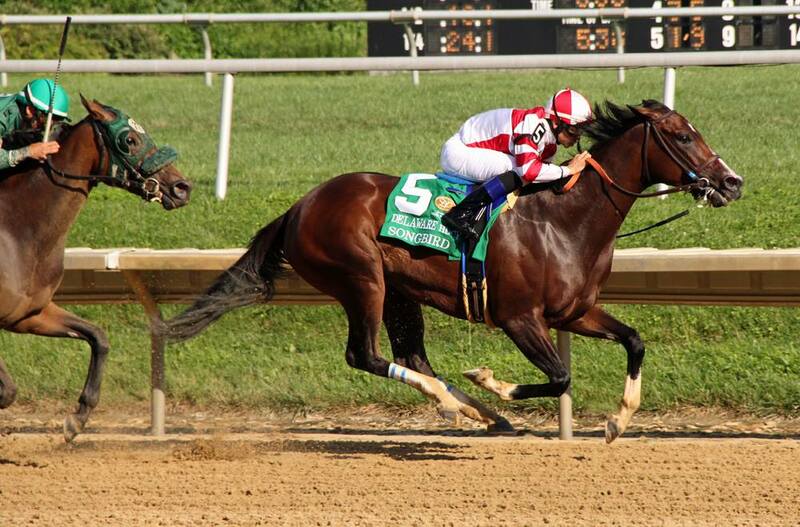 Last year, she also won the mile-and-a-quarter $600,000 Alabama Stakes at Saratoga and the mile-and-seventy-yard $50,000 Light Hearted Stakes at Delaware Park. She has a career record of four wins, three seconds and a third from 10 starts with earnings of $870,325. William Mott has won the Delaware Handicap twice with Royal Delta in 2012 and 2013. Red Oak Stable’s Unbridled Mo is the top weight at 120 pounds. In her most recent outing, the 5-year-old daughter of Uncle Mo ran third in the mile and a sixteenth $750,000 Grade I Ogden Phipps at Belmont Park on June 9. Previously, the Kentucky-bred conditioned by Todd Pletcher posted a 2¼-length victory in the mile-and-a-sixteenth $700,000 Grade I Apple Blossom Stakes at Oaklawn Park on April 13. In her only other outing this year, she ran fourth in the one-mile $200,000 Grade III Royal Delta at Gulfstream Park on February 19. Last year, she won a pair of Grade III events – the mile-and-a-sixteenth $400,000 Houston Ladies Classic at Sam Houston and the mile-and-a-sixteenth $100,000 Doubledogdare at Keeneland. She has a career record of seven wins and a third from 11 starts with earnings of $1,035,880. Trainer Todd Pletcher is seeking his fifth Delaware Handicap victory, which would set the record for most wins by a trainer in the race. Pletcher won his first Delaware Handicap in 2001 with Irving’s Baby; he followed with back-to-back victories with Fleet Indian in 2006 and Unbridled Belle in 2007, and his most recent was with Life at Ten in 2010. He is currently tied with Henry Clark, who won the race in in 1958 and 1959 with Endine and in 1969 and 1970 with Obeah. Unbridled Mo is in post five with John Velazquez up. The connections of Fuhriously Kissed cannot wait to run her the mile-and-a-quarter distance. In her most recent race, the 5-year-old daughter of Langfuhr finished seventh in the mile-and-an-eighth $200,000 Grade II Fleur de Lis at Churchill Downs on June 16. Previously, the Kentucky-bred ran third in the mile-and-an-eighth $150,000 Grade III DuPont Distaff at Pimlico on May 18. On April 13, she ran third in the Apple Blossom at Oaklawn Park. She has a career record of three wins, three seconds, and four thirds from 18 starts with earnings of $263,247. St. Elias Stable’s Teresa Z has been pointing for the Delaware Handicap since the end of her 3-year-old campaign last year. In her most recent outing, the 4-year-old daughter of Smart Strike won the local Delaware Handicap prep – the mile-and-an-eighth $100,000 Obeah Stakes on June 16. Previously, the Kentucky-bred finished third in the mile-and-seventy-yard $60,000 Serana’s Song at Monmouth Park on May 12. In her only other outing this year, she was unplaced in the seven-furlong $300,000 Grade I Madison Stakes at Keeneland on April 7.